Like California Chrome, another California bred powerhouse who was unappreciated until his Derby win, the Sequoia fig surpasses its peers in performance. 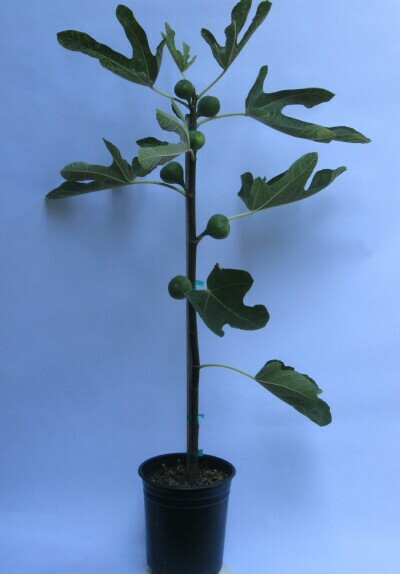 The tree is compact yet vigorous when grown from cuttings (rather than the tissue culture specimens used in early trials). Leaves are deeply lobed, even more so than Negronne's. And those plentiful twice a year fruit! The Calimyrna heritage is evident on first bite of the celadon skinned fig, with amber flesh you'll swear is made from marzipan. Fruit will ripen in both coastal and interior regions. As of March 2019, trees are about 3' tall, 1/2" caliper. Grown in 1 gal pots. Propagation of this patented variety is prohibited.